Michael “Slick” Anderson embraces family and pain. For Anderson, a family has your back when things get rough, and pain represents where he is from (Newark, NJ), his DNA, and entertainment. “Knockdowns and knockouts are what makes fans hit the rewind button and give fans the ultimate entertainment. On February 8th, the fans at the Dorton Arena in Raleigh, North Carolina will be entertained, and I will give them a reason to hit the rewind button.”…Michael Anderson. Anderson 17-2-1 (12 KO’s) fell in love with the sport of boxing after he received a black eye sparring in the gym. “Back in the day, my uncle bought me some cheap Everlast boxing gloves. They were like pillows. So, me and my cousin would go at it in the hallways. Years later, A late friend of mine talked about how hard it was training. I had a karate background and told my friends because what I went through in karate, boxing would be easy. I went to the gym and sparred. I had a tough time with a guy, but it gave me the drive to keep coming back. Dude gave me a black eye. I have been going to the gym ever since,” said Anderson. Anderson has had a stellar professional career. After making friends with former World Champion Sugar Shane Mosley on social media, Mosley brought Anderson to the world famous Big Bear Lake to train. Anderson was so impressive, he was given the opportunity to make his pro debut on the undercard of Sugar Shane Mosley vs. Miguel Cotto. The Mosley Cotto fight took place in 2006 at Madison Square Garden in New York and is one of the biggest fights in boxing’s rich history. Anderson won his pro debut in front of 16,000 fans and carried an unbeaten streak through his first twelve fights. Anderson built a false sense of invincibility and tried to battle through injuries and distractions. The feeling led to his first and second professional losses. 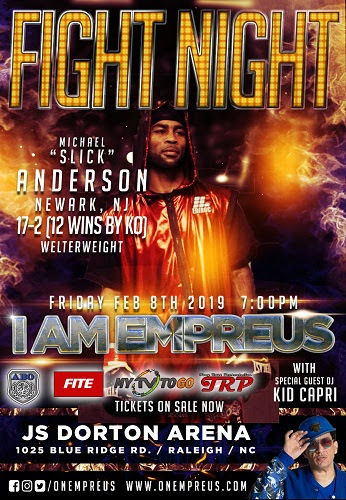 Anderson did battle back to run off four straight wins and a UBF All America Welterweight title, but his body, physically and mentally, needed a break. Anderson took some time off to heal and returned to the ring in December of 2018 winning his first fight in three years. “I had a little ring rust, but I was so excited to get in there and battle,” said Anderson. On February 8, 2019, Anderson will be fighting for the second time in three years. He will be challenged by Richard “Tiger Lee” Hall. While Hall is a journeyman fighter with a not so stellar record, Anderson refuses to take him lightly. “I will be honest. “I know my opponent is five foot eight inches tall and I saw a forty-second clip of him fighting. I will not take him lightly or any other man that puts on the gloves and willing to get into the ring. Like my trainer tells me all the time. “A guy might have a bum record, but what if on the night he faces you he decides that is the night he is going to be a world champion and not a bum? So, I have to take him seriously, and I can tell you this, he (Tiger Lee Hall) is going to go through something on February 8th,” said Anderson. Anderson expects a large turnout in Raleigh, North Carolina from his New Jersey-based fans, his motorcycle club, and all of his supporters, who have relocated to the Carolinas. Anderson, who is shooting a documentary and publishing a book, wants fans to know they will not be bored on February 8th. He is coming to earn an impressive win, and entertain the crowd. Quite frankly, as Anderson sums up everything, “I’m bringing the North and that is a whole lot of pain. I’m going to win and it will be impressive. Knockouts entertain and sell. I’m going to entertain and I’m gonna force fans to hit the rewind button.”…Michael “Slick” Anderson.